Scleral lenses are an excellent choice for a wide variety of contact lens wearers. 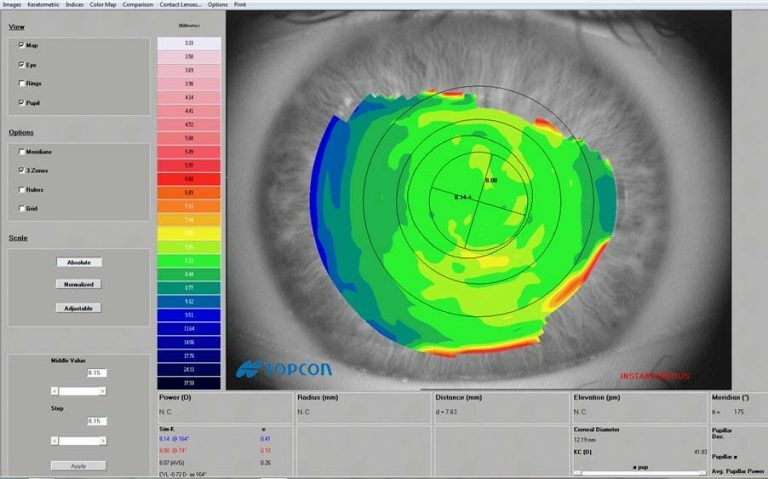 Here at Amar Shah Optometrists, we’ve been able to assess, work with and help patients regain their vision in HD. Chances are you’re now wondering, what are scleral lenses? How are they different to normal lenses? And why are they important? Well, thankfully we’ve got you covered here. Read on below and we’ll answer your questions. You might even learn a thing or two! As we’ve touched on above, they are specialised contact lenses that can work for some users where other lenses have not, or they at least will work better than others. The main difference is that the lens itself sits on the white of the eye otherwise known as- and here’s where the name comes from- the sclera. Normally your lens would sit on the cornea, the front of the eye. By sitting on the sclera it means that the lens covers a larger than normal area. This area essentially fills with artificial tears that allow it to securely fit around your eye. Thanks to the larger coverage these lenses can provide sharper, HD style vision, they’re more durable, less fiddly to handle and therefore much easier to adapt too. Generally scleral lenses are fitted at the eye hospital here in Bristol, and there are few other practices that offer scleral lens fitting in the local area. Deciding to address that problem, we’ve developed our practice to be able to offer scleral lenses to patients that require them. 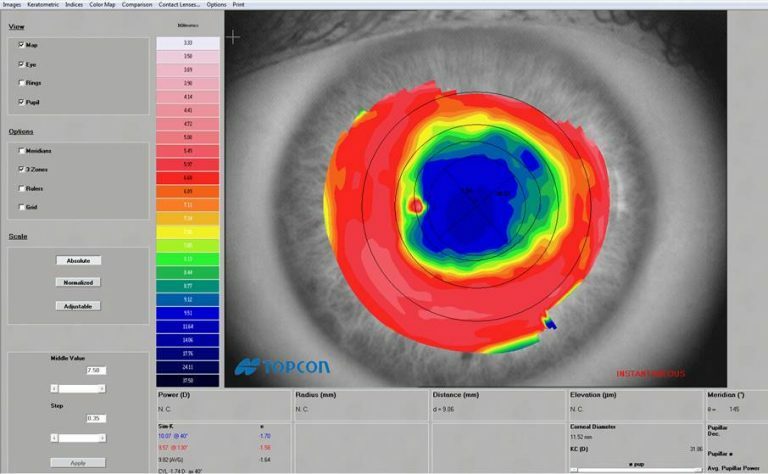 We’ve included below some corneal topography – shape – scans. They might look like a weather map to the untrained eye, and that’s not surprising! Put simply, a regular cornea with a good level of vision will have a high concentration of green to yellow areas with little red-white and blue areas, and therefore be more regular in shape. This first image shows a regular, normal shaped cornea. You can see the high concentration of green in the central sections. We took this second image of a patient after they had undertaken refractive surgery. You can see the concentration of deep blue in the centre and reds around the outside. There are very minimal areas that match the normal, healthy green in the middle. Eyes that match this second picture may be a great fit for scleral lenses. Can scleral lenses help you? At this point, you’re likely wondering if scleral lenses are for you. This helpful list below should point you in the right direction. If you’re still not sure if they’re for you then we’ll happily talk it through with you and discuss if scleral lenses are the correct choice for your eyes. Complicated prescription lens wearers who have previously been told they cannot wear contact lenses. People who have struggled with contact lenses in the past due to poor comfort or vision. Suffers of Keratoconus or other types of corneal degeneration or dystrophy, or transplant patients. Patients who have suffered scarring, trauma or post-laser correction complications. So, what are the benefits of scleral lenses versus normal lenses? There are a number of benefits to scleral lenses. Many people consider the biggest to be improved, consistently clearer vision all day long. The remaining benefits are quality of life improvements that will make little differences to your daily routine. As mentioned above, thanks to their larger size they are easier to insert and remove. They will rarely dry out therefore improving your overall comfort. Finally, with proper maintenance a scleral lens will last for over a year. Thanks to advancements in technology in general as well as scleral-specific expertise, tiny microscopic alterations can be made to your scleral lenses meaning that they are truly bespoke to you and your eyes. We’re really excited to be able to provide these new and exciting styles of lens in our Bristol practice. If you’d like to find out more, please give us a call or drop us an email. Failing that, you know that we always welcome visitors to the practice for a chat so come on down and see us!